Product code: P01 Categories: Browns, Cotton, F Schumacher, Floral Stripes, Luxury Fabric, Multi-coloured. Annabelle Floral by F Schumacher combines bouquet detailing with a banded striped backdrop. The stripes are a warm brown and a cream with a touch of light yellow. The floral bouquet detailing is makes use of creams, oranges, lilac while the foliage is olive green and dark green. This traditional design has a real sense of warmth and a richness to it. A good quality cotton fabric that can be used for a range of home interior soft furnishings. Annabelle Floral would be an ideal choice for drapes with matching cushions. 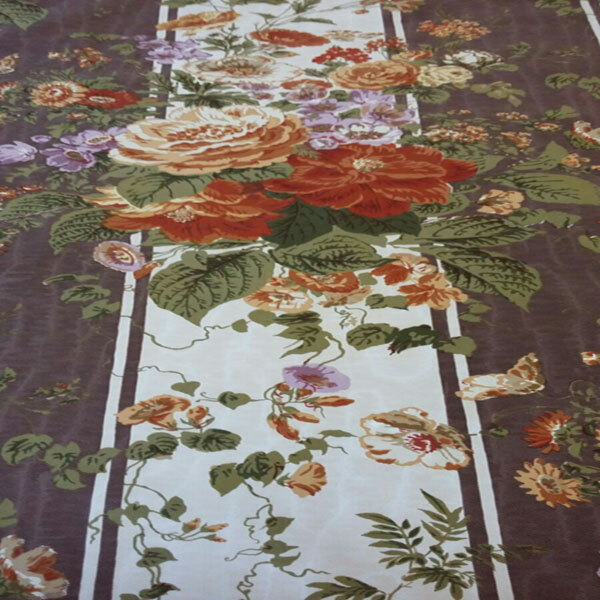 The fabric measures 1 metre 35 centimetres in width with a pattern repeat of 90 centimetres. This quality F Schumacher fabric is hand printed in the UK. Our fabrics are sold from the roll, orders will be processed as a single continuous piece.